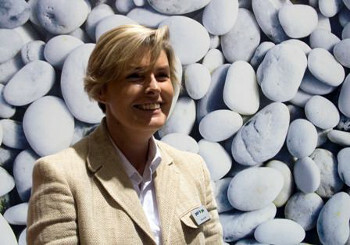 sales and marketing director Sylvia MuhrSwiss digital printer manufacturer Polytype has reported that its new Virtu quantum series of digital printers launched at drupa has already meet its annual sales target in the first half of 2012. The company said that three Virtu quantum 35 engines and two Virtu quantum 25 machines have been sold, with two being installed in Switzerland, and a further three going to Germany. Polytype SA (formerly WP Digital) is a manufacturer of resilient, reliable printing technologies for the production of many different decorative, display and industrial applications. It added that it’s the unique combination of speed, flexibility, stability and output quality that won the Virtu quantum series plaudits on the show floor at drupa 2012 where it was unveiled to a global audience for the first time. The 2.5m Virtu quantum 25 demonstrated on the stand has ten-picolitre print-heads, which allow for high-definition printing onto a wide variety of common and unusual substrates. The response to the Virtu quantum series at drupa was fantastic," says Sylvia Muhr, Head of sales, digital printing, Polytype. "We knew there was a gap in the market for an industrial and display printer capable of finely-detailed output, and the reaction from buyers goes to show that we were right to anticipate the demand. We expect sales to carry on growing as more of the industry discovers the Virtu quantum's potential." Other features highlighted included low running and service costs and fast support turnaround time. In addition the company pointed out that ink prices are highly attractive thanks to the Virtu quantum's upgraded software, which ensures exceptionally low ink consumption without compromising on output quality. One impressive endorsement of Polytype's excellence in its field was the fact that three Virtu quantum machines went to existing customers who already owned one of the quantum's 30-picolitre siblings, now known as the Virtu abacus series. The buying decisions were made following trials with machines from other manufacturers which convinced the companies concerned that the Virtu quantum was best suited to their needs. 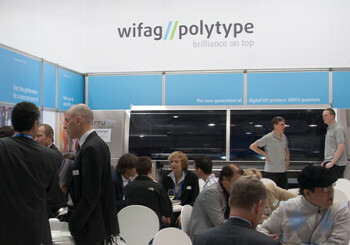 The Virtu quantum attracted significant attention to the WIFAG-Polytype stand at drupa 2012"At Polytype, we have a long-standing reputation for quality and service so for us it's not surprising that our customers come back," Muhr comments. "Even where our competitors can offer a lower price, the personal attention of our sales team and service department to every customer is integral to our ethos and we believe that's why our customer base is so loyal." "With Polytype we are treated like a VIP customer in every sense, but know from other customers that we are treated the same as every other.”This is why we continue to invest in Polytype's Virtu range over and over again."